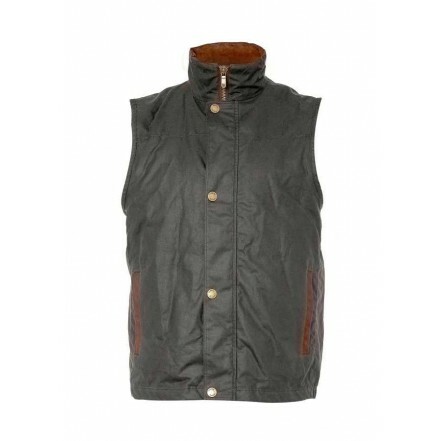 Men&apos;s gilet Mayfly, part of Dubarry&apos;s new men&apos;s clothing collection, is a waxed cotton gilet, incorporating Primaloft for light-weight warmth. Mayfly is a key item of men&apos;s outerwear, perfect for layering. Stylish and practical men&apos;s fashion for both city style and country wear. Perfect worn over Dubarry men&apos;s knitwear and shirts or layer over a Dubarry men&apos;s jacket, with Dubarry leather country boots or Chelsea boots. Men&apos;s waxed cotton gilet with water repellent finish and real leather trim, metal centre front two-way zip, covered by a studded placket. • Waxed Cotton with PrimaLoft® fill for extra light-weight warmth. • Sponge clean outer fabric & leather only.